Does Woot Math work with homeschool students? While Woot Math was designed for classroom teachers to reach more students, we also have a lot of homeschool parents that want to use Woot Math (after all, you are teachers too!) Here are a couple of strategies for implementing Woot Math with your children at home. Woot Math’s Adaptive Learning content can help you address gaps in foundational topics like fractions. This instructional content is delivered with an adaptive engine and has been shown in two randomized controlled trials to deliver a 2X increase in learning. You can review Woot Math’s scope & sequence here. To just use Adaptive Learning with your children, you can filter by the Adaptive Learning content. Simply check the Grades 3-7 filter as shown, and only the Adaptive Learning content will be shown. 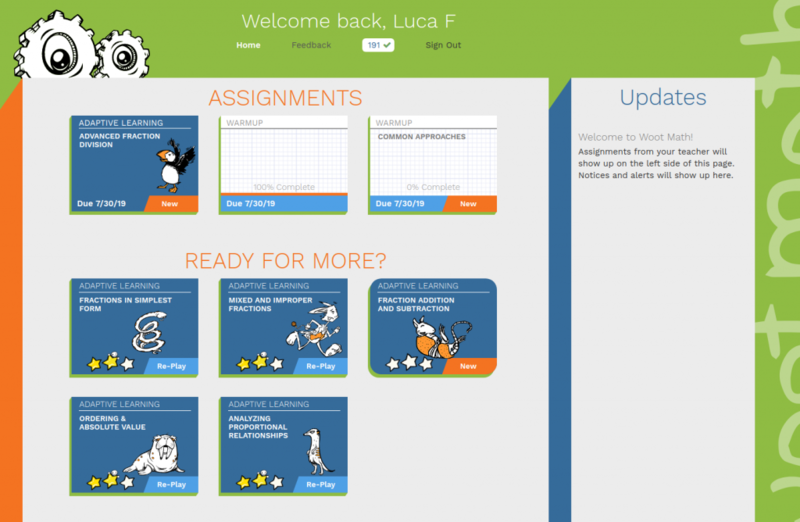 Once you assign your first Adaptive Learning assignment, it will appear on your child’s dashboard. As your child completes Adaptive Learning assignments, the next appropriate one will automatically open (in the READY FOR MORE area) as shown below. As part of the free tier, Woot Math provides some Adaptive Learning content for free, and more available with the premium tier. We do have special homeschool pricing available, please contact us if you are interested. 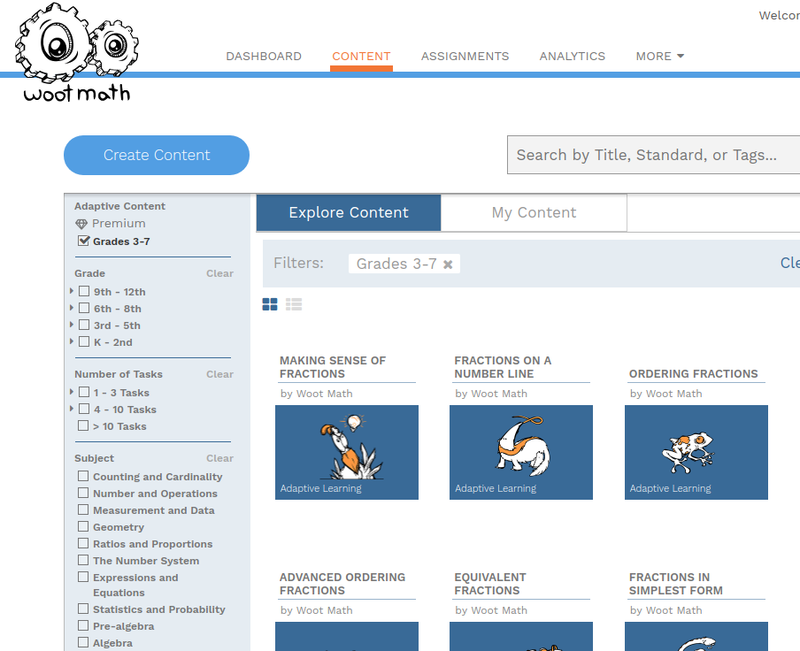 Woot Math also provides K-12 quizzes, exit tickets, warmups and more. These formative assessments are not part of the adaptive progression of Woot Math, so new ones do not get automatically assigned like the Adaptive Learning lessons. Rather, think of them as homework, quizzes, or even tests. Using the same filtering as shown above, simply filter by grade, number of tasks, or topics to select the desired content. You can preview, copy, and even modify them to customize them for your needs, and then make assignments to your child. Two examples of this are also shown above on the student dashboard (the two white tiles labeled WARMUP). These are all FREE, and available to everyone with a Woot Math account! If you would like to get started with Woot Math, please check out the interactive PD for quick videos to get you started. There are also lots of additional resources on the resource page. While many of these are designed for teachers in a classroom, they will be just as applicable for homeschool parents! PrevPreviousWhat is the scope & sequence for Adaptive Learning?